I’ve just got back from Huddersfield. “Why did you go to Huddersfield?” I hear at least one person shout. I went to Huddersfield to meet up with Magic Rock Brewing Co. and present them with their CAMRGB Beer Of The Year Award for Human Cannonball. I arrived just after 11am, and walked in to the Magic Rock office to be greeted by Richard. The tiny office is the hub of all their stocktaking, sales and distribution and reminded me a lot of the tiny office I used to organise concerts from in London – Computers, bits of paper tacked to the walls, and a few empty bottles strewn around (I noticed a rather dishy looking Sierra Nevada bottle that I’d not seen before). 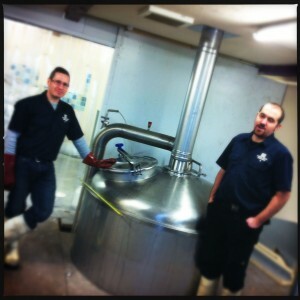 Richard showed me around the brewery while they were racking and talk moved between why Magic Rock make the beer that they do and why CAMRGB is happening. It turns out that much of the philosophy and thinking that made Richard want to make beer is the same that holds the CAMRGB thing together – It’s a simple passion for a great tasting product that’s fun and fulfilling and good to share. 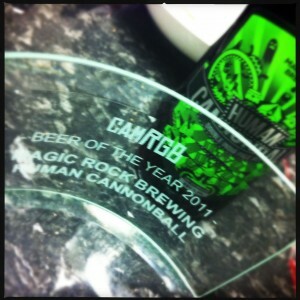 So it seemed very fitting that Magic Rock should receive the first ever CAMRGB award. Before I left I took a few snaps of the award winners and was given a taste of one or two of the beers. I had a lovely 3rd of Cannonball from keg and it had a much deeper flavour than the bottle I’d enjoyed so much a while ago – The citrus was hard and clean and the finish intensely dry. This was followed by a taste of Bearded Lady. I only had a couple of mouthfuls as I was driving, but this 10% stout is immense. Thick treacle, coffee beans, dark bitter chocolate and a lovely hoppy finish. Finally I got a taste of a new beer that they’re working on. Magic 8 Ball is a black IPA and, though it wasn’t quite right was pretty damned good nonetheless. The Nelson Sauvin giving that rounded tamarind edge. 8 Ball will be great when it’s ready. 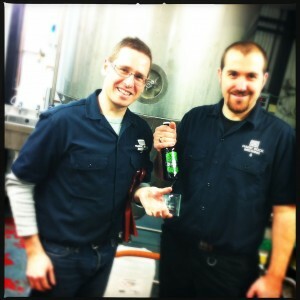 With that, I thanked them for their time and congratulated them on winning the Beer Of The Year Award. On the way back I dropped in on Steven from Aletalk for a fine and much needed cup of tea and a natter. It was really good to finally meet him in person, after all he pretty much built the CAMRGB site and is massively supportive of what we’re trying to achieve. Then I started my journey home. And it started to rain. Big, fat, hard rain that added an hour on to my journey and got me home in a bad mood. Now I’ve settled down again and peeped in the fridge at the bottle of Human Cannonball chilling for tonight I’m all happy again. So, one final congratulations to Magic Rock Brewing Co. for winning the award. And thanks for being such fine and friendly chaps. Oh, and Steven, I’ll buy you a beer next time I see you. 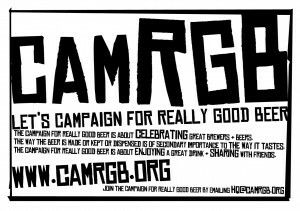 This entry was posted in Beer Review, Brewery, CAMRGB and tagged 7.5% +, Beer, Beer Events, Beer Of The Year 2011, Beer Review, bottled beer, Brewery, Brewery Interview, Brewing, CAMRGB, Drinking, Magic Rock Brewing Co.. Bookmark the permalink. 3 Responses to Meeting Magic Rock Brewing Co.
It’s only small but I thought it looked quite classy.